Scholarships applications deadline for 2019 is now over. Stay tuned for next year, InshaAllah. 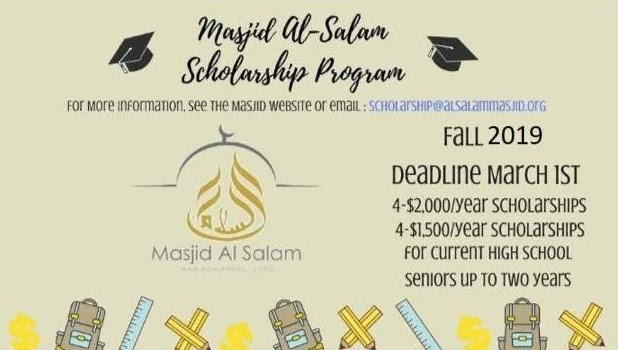 The goal of the Masjid AlSalam scholarship program is to provide financial assistance for university or community college tuition to students in its community. Four $2000/year scholarships and four $1500/year scholarships for up to two years to graduating high school students who exhibit financial need. To be awarded for the FALL 2019 semester. Scholarships are not available for summer or minimester classes. Scholarship is open to everyone, with financial neediness considered as a factor. Attending an accredited public institution. Send an email to [email protected] that contains your completed application and a photo of a bill that has the name of someone in your house and your address. Applicants will then receive an ID number, which will be used for all required documents thereafter. DO NOT include your name on your essays. Include your ID # in all email correspondences. Submit resume via email (replace your name with your ID #). Name your file in the following format - ID#_Resume. Resume should be a single page. Please look up sample resumes to know what your resume should look like and ask your teachers to review them. Use ID# instead of name. Page number and ID# in the header. Submit Essay 2 to [email protected] answering the prompt of essay A, B or C from Apply Texas. Only one of the three essays (A, B, or C) that were prompted for are required for the Essay 2 requirement. (Link to Essay Topics - https://www.applytexas.org/adappc/html/preview19/essay_preview.html). Paper length should be between 1 page double spaced (22 lines) and 3 and an half pages double spaced (~80 lines). We will accept any essay you submitted to ApplyTexas, but we do not recommend you go beyond ~80 lines. Follow the same formatting guidelines as Essay 1. Fall 2018 Recipients will be announced prior to high school graduation and will be asked to submit a photo ID and university information. Complete 50 community service hours a year per semester of scholarship awarded PLUS one year.